This week, we cover the story of Engelbert Kaempfer, who wrote one of the most thorough and best known accounts of Japan for Western consumption before the Meiji era. How did this random German dude end up in Japan? What did he write about it? What did he think of it? And why do we care? Roberts, J.A.G. “Not the Least Deserving:The Philosophes and the Religions of Japan.” Monumenta Nipponica 44, No. 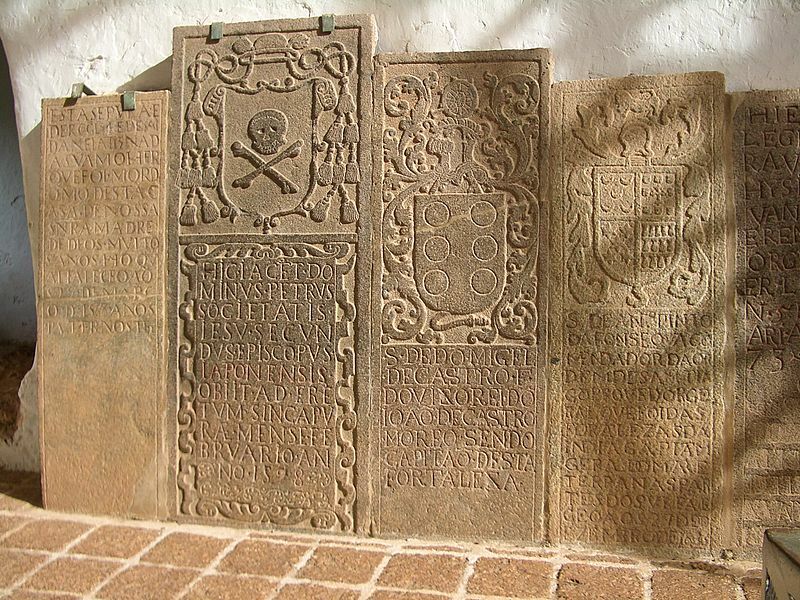 2 (Summer, 1989), 151-169. Michel, Wolfgang. “His Story of Japan: Engelbert Kaempfer’s Manuscript in a New Translation.” Monumenta Nipponica 55, No 1 (2000), 109-120. 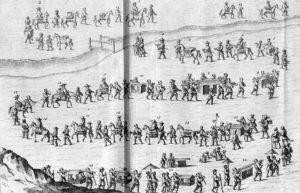 A fascinating academic piece on prostitution and the Dutch in Nagasaki. A complete version of the Kaempfer text from Archive.org. 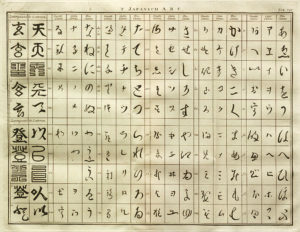 Kaempfer included several diagrams and images in his notes, including this one where he broke down the components of the Japanese phoenetic alphabet. In addition to being a helpful historical tool, it’s impressive because it means that unlike many Europeans of his day, he cared enough to try to learn the basics of the language. 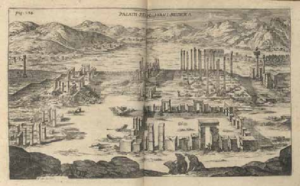 Kaempfer got his start as a documentarian in Persia; this sketch is his work on the ruins of the old Achaemenid Persian capital at Persepolis. 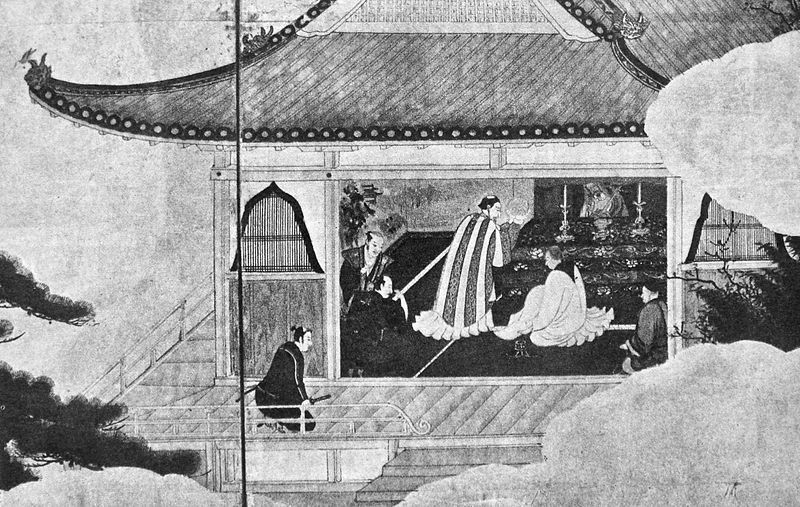 Kaempfer’s sketch of a sankin kotai retinue — a lord and his followers on their way to attend to the shogun in Edo. A part of Kaempfer’s original manuscript from the British museum. 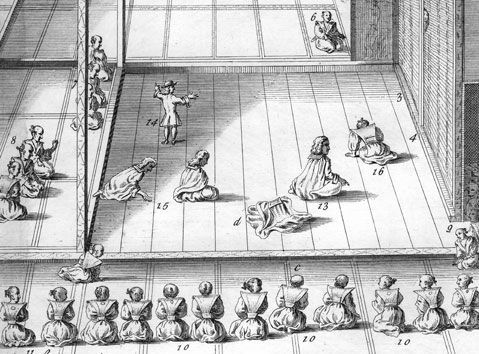 Kaempfer’s sketch of an audience with the shogun. Note the careful attention to the detail of the clothes, rather than simply drawing all the outfits the same or in a more European fashion. 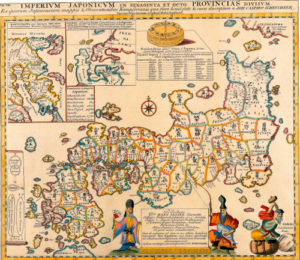 Kaempfer’s map of Japan, using the original 60 provinces of Japan as its basis. A century and a half later, another German, Franz Philip von Siebold, would be kicked out of the country for having something like this, but Kaempfer was able to just acquire it no questions asked. This week, we’ll continue our discussion of Japan’s Christian century with the high-point of Christian missionizing in Japan, starting with the arrival of St. Francis Xavier. Xavier’s mission will mark the start of Christianity’s spread through the islands, but within half a century the progress of the missionary movement will have halted and Japan’s Christians and the powers that support them will be facing serious threats to their power and position. Boxer, CR. 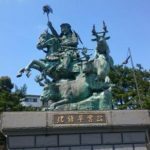 The Christian Century in Japan. Sansom, George. 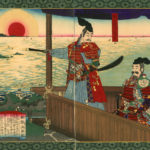 A History of Japan, Vol II: 1334-1615. 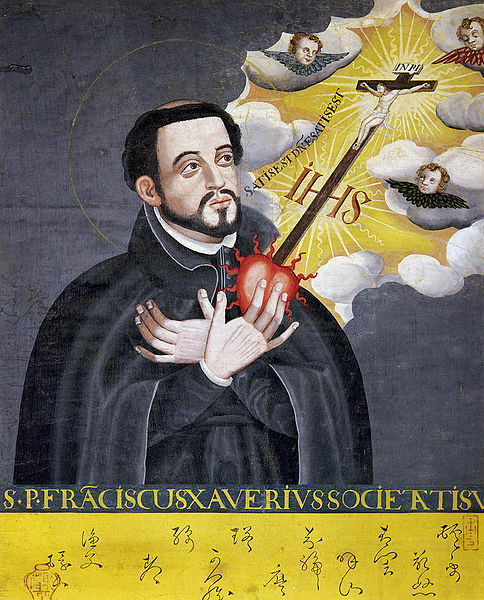 St. Francis Xavier, the man who would open the floodgates for Japanese Christianity. 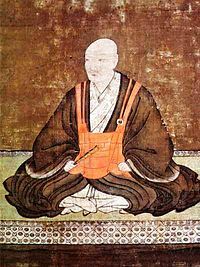 Otomo Sorin, the daimyo who received Xavier and decided to tolerate open Christian preaching. 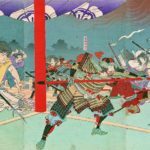 This decision would make the Otomo one of the most powerful clans in Japan. A period woodblock showing celebration of a Christian mass by Japanese converts. The so-called Tensho Embassy, a group of Otomo-clan samurai sent to Europe in the 1580s. 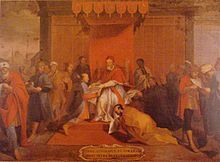 Here they are shown meeting Pope Gregory XIII. 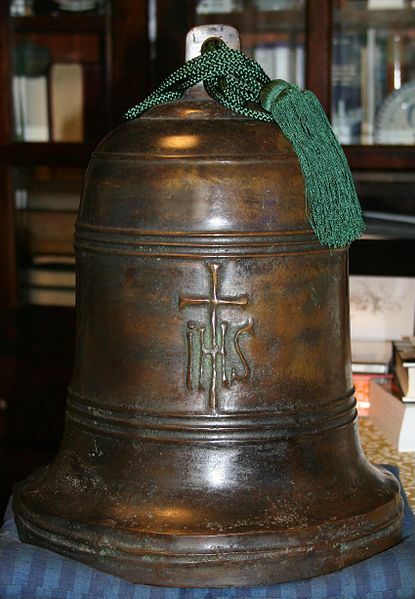 A Japanese church bell cast in the 1570s in Nagasaki. The inscription (IHS) imposed on the cross is a common shorthand for the name of Jesus. 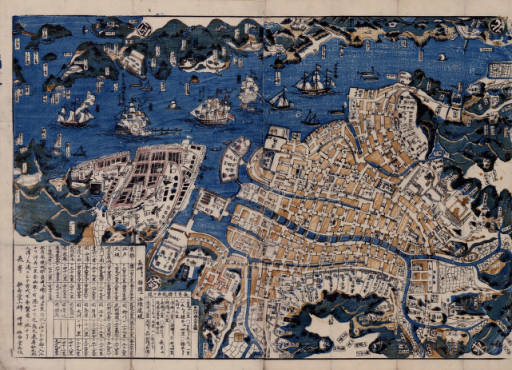 A map of Nagasaki, which grew into Japan’s pre-eminent trade hub as a result of the Portuguese/Spanish trade. Note the foreign ships sailing into the harbor. The grave of a member of the Society of Jesus martyred by Toyotomi Hideyoshi in 1597.